A couple months ago I decided to make some improvements on my layout. I tore out most of the track and started over. I carefully relaid the track to a better standard and I was finally able to operate derailment free. The only problem I had was sound equipped engines stalling on the frogs. So I bought Rapido Railcrew switch machines and installed them. I got them working, built a control panel and was quite happy. Then I started wiring them to power the frogs. I ran Feeders from the stock rail to the closure rail so that the points didnt have to rely on the connection with the stock rail to carry all of the power. I ran a screw into the hole on the bottom of the frog on the Atlas switches and soldered a wire to it to carry power to the frog. i wired the switch machines per Rapido’s instructions. They all were wired right with my multimeter showing proper continuity in the direction the switch was thrown. i put my most finicky engine (a BLI SW7 that stalls until it’s been on the track awhile then it runs pretty well, still haven’t figured that out) on the track started it moving as slow as it would creep. Made it all of the way down to the end with no problem and started coming back. I got to the first switch on the way back and opened it to head down the divirging route and i got a short. it turned out that as long as all of the switches on that route were lined the same everything ran fine. But as soon as I lined any of those switches for a diverging route the layout shorts out. And to add insult to injury, the engines still sometimes stall on the switches. I’m sure I am missing something really simple. I prepared the switches per the diagrams on the Wiring for DCC website. If I had the feeders for the track power to the switch machines it wouldn’t run at all. Right? The only thing I haven’t tried is electrically isolating each switch (turnout). Wiring for DCC recommends power at all three ends of the switch so that’s how I wired it. It runs fine (except for excessive stalling at the frogs) if I disconnect the wiring to power the frogs. Put a insulated rail joiner on the divergent rail and the straight route after the frog. Or cut gaps. Disregard the above statement. I was thinking of a double ended siding with power routing turnouts. After re-reading Your post I believe You may have a crossed wire in Your trackwork. A diagram would help of Your set-up. Jeff, what kind of turnouts are you using? I ran a screw into the hole on the bottom of the frog on the Atlas switches and soldered a wire to it to carry power to the frog. Atlas switches, I suppose you could have drilled a hole in a snap switch, but you would have told us that, right? So presumably Mark 4's. They shouldn't need insulated joiners on the frog rails unless there is a reversing loop downstream. If I had the feeders for the track power to the switch machines it wouldn’t run at all. Right? That you ask the question, makes me nervous about your wiring. I don't know the answer to that question though. I think Jason will forgive me for posting this, if it helps sorting things out. I see two sets of white, yellow and blue wires. That looks like a potential source of confusion. Again I'm not sure what would happen if you were powering the frog from the led circuit. Wiring for DCC recommends power at all three ends of the switch so that’s how I wired it. We had someone with a similar problem with Atlas frogs. He kept starting new threads on the same problem, which meant everyone had to be brought up to speed. Ultimately the problem was his hole drilling and soldering skills. I see a voltmeter in your future. It probably is something simple and something that you did the same on each turnout. I would try to cut the power to everything but one turnout and figure out where there is continuity and where there isn't. If the locos are still stalling on the frog, then the frog isn't seeing the correct power. Thanks, Henry, I missed that. My Atlas looks like Jason's diagram, the frog rails are isolated from each other and from the frog. 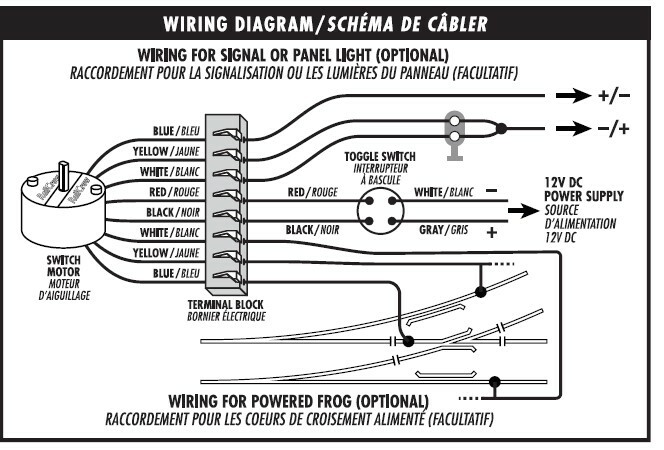 The only thing that would probbaly happen if the white/yellow/blue wires were mixed up is that the frog wouldn;t get power. Each set of the three colos is a SPDT switch, if the frog is fed fromt he common of one switch but the rail A and rail B wires are connected to the terminals of the other internal SPDT, then nothing will happen, the frog just won't get power. Can you post a diagram of the track in the area where you are having this shorting problem? The way Atlas turnouts are made there is no need for extra gaps anywhere, and they should never short. Even with feeds to each of the 3 legs. I wired all of mine like that. 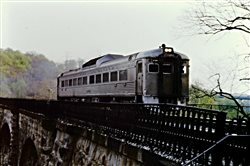 Perhaps there is a feeder backwards somewhere, or the one of the Railcrew contacts is connected to the wrong bus line. It had the feeders for the track power to the switch machines it wouldn't run at all. Right? The wires for the frog power MUST come from track power. They must be the same polarity as the tracks on either side of the turnouts. I'm not sure what you mean by that sentence. Thanks for all of the suggestions. I cut gaps to isolate one of the switches and it didnt help. I';m heading back down to basement to try to figure this out. I will post when I find the error. How about a track diagram or drawing of the affected area? The problem was simple operator error. After crawling back under the layout and going over every connection I found that one had been connected so that only 7 pins were connected instead of all 8. In addition I found one where the wire had pulled out of the connector that came with the switch machine. I should have followed Jason's advice in the Rapido video and cut those connectors off and soldered them. I used the connectors because I'd rather avoid soldering under the layout. I will replace the conntectors with a better design when I install more of the switch machines.